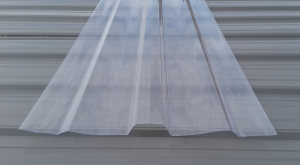 These tough clear panels have the same profile as our standard 29ga roofing panels, which makes them perfect for skylights & widows in barns and sheds, or building greenhouses! 8' & 12' panels in stock. These #2 Grade clear panels have ripples, dimples, and other inconsistencies. They are still the same profile as our standard 29ga roofing panels, which makes them perfect for skylights & widows in barns and sheds! These clear flat panels come 4' wide by 3/8" thick. And work great for greenhouses! Just leave 6 inches on either side of your ridge, and install these clear polycarbonate ridge caps for more daytime light than you'd think! Perfect for barns, sheds & greenhouses.